On my quest to discover new and interesting beauty products, I’ve been introduced to something I never imagined I would put in my hair. 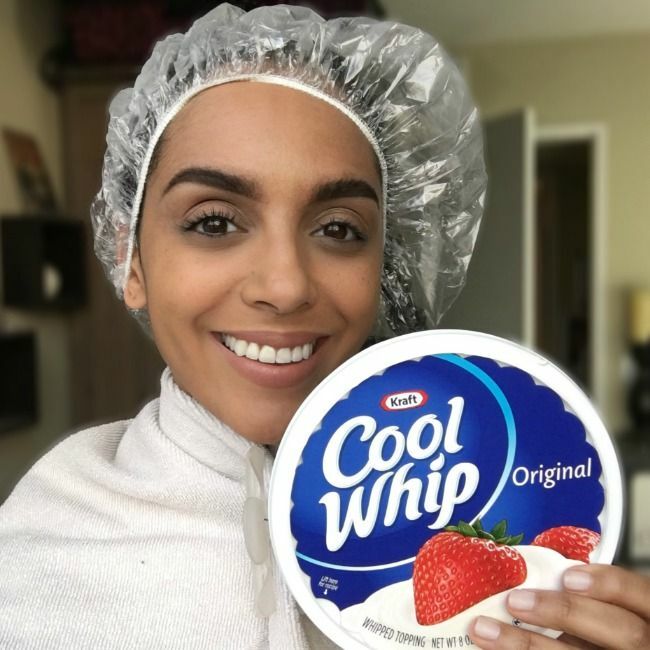 I’m a big fan of multi-purpose products so when I heard that you can use Cool Whip as a deep conditioner, I jumped on the experimental train. I’ll try anything once and this sounded fun and easy. I didn’t necessarily mix anything together to make it a true DIY--the simple fact that I’m using something from the kitchen made it enough for me. I’ll try anything once, and this sounded fun and easy. Although Cool Whip contains ingredients that I wouldn’t necessarily consume, it does contain coconut and palm kernel oils that are great for softening and adding shine to the hair. Although Cool Whip contains ingredients that I wouldn’t necessarily consume, it does contain coconut and palm kernel oils that are great for softening and adding shine to the hair. According to LiveStrong, both coconut & palm kernel oils contain lauric acid (a type of saturated fatty acid). There is a higher amount of lauric acid found in coconut oil, which aids in strengthening hair strands. Keep in mind that these are in the hydrogenated form. Plus, there are many other ingredients involved, so you won’t necessarily get all of the amazing benefits that you would get from using these oils in their natural state. However, for the sake of an experiment I still wanted to see what the hype was all about. Using your measuring cup, measure out 1 cup of Cool Whip (1/2 cup for shorter hair). Wrap a towel around your neck to avoid a mess on your clothing. Using your hands apply the Cool Whip on dry or wet hair from root to tip. Once your hair is saturated, place your disposable shower cap on and leave on for 15-20 minutes. Rinse well and then continue with your normal wash routine. It was strange to apply cold, Cool Whip to my curls. However, I loved that the mask wasn’t messy and stayed in place. After 20 minutes under the disposable shower cap, I felt my hair and it was noticeably softer. It was very easy to rinse out, unlike some of the other DIY masks I’ve tried in the past. I didn’t feel the need to use a shampoo so I just co-washed with my conditioner. It gave me softer curls that were shiny but lacked moisture. Unfortunately, the cons outweigh the pros on this mask. My hair did feel noticeably softer but it didn’t provide a lot of moisture to my curls. It also lacked slip. It wasn’t easy to slide my fingers through my hair. Also, applying cold Cool Whip on my hair did make the experience a little less enjoyable. The only real benefit I noticed from this was that my hair did look a bit shinier but that could have been due to the conditioner I added in my co-wash. It wasn’t my favorite hair mask, but still fun to experiment with nonetheless. I’d be very interested to see if trying this on wet hair or using Creamy Cool Whip next time would make a difference. Perhaps, those with naturally straight or wavy textures will have better luck than me. I think I’ll stick to my all natural DIY hair masks in the future.